The black-naped oriole (Oriolus chinensis) belongs to the family of Old World orioles, the Oriolidae. The black-naped oriole species is distributed in India, Bangladesh, southeast Asia, china, Russia, Taiwan, Japan, North Korea and South Korea. These oriole species are partially migratory. These orioles are polytypic species. The black-naped oriole (Oriolus chinensis) is a medium-sized oriole, measuring 25 to 30 cm in length and weighing 60 to 100 grams. 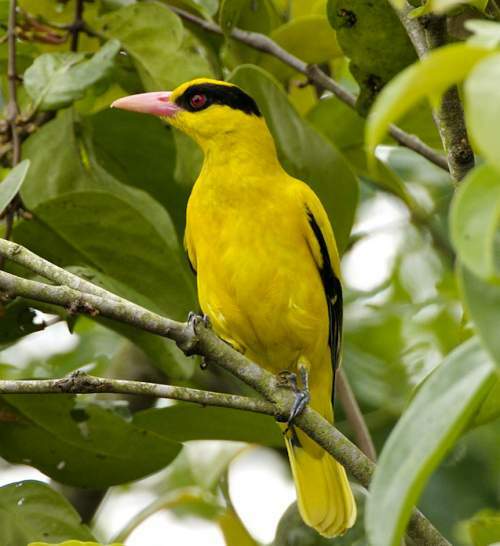 The adult black-naped oriole has bright golden-yellow head, upperparts and underparts. The wings have varying levels of blackness among the subspecies. There is a broad blackish band from the lores, passing through the eyes to meet at the nape. The uppertail is blackish with yellow edges. The undertail is golden yellow. The juveniles have dull yellow plumage. In juveniles, the eye band is diffuse and the underparts have dark streaks. The bill is stout, long and pinkish. The upper mandible is blackish in juveniles. The irises are red. The legs and feet are gray. The call of these species is a loud fluty whistling sound. These black-naped oriole species are distributed in Russia, China, North Korea, South Korea, Taiwan, India, Bangladesh, Myanmar, Thailand, Cambodia, Laos, Vietnam, Malaysia, Singapore, Brunei, Indonesia and Philippines. 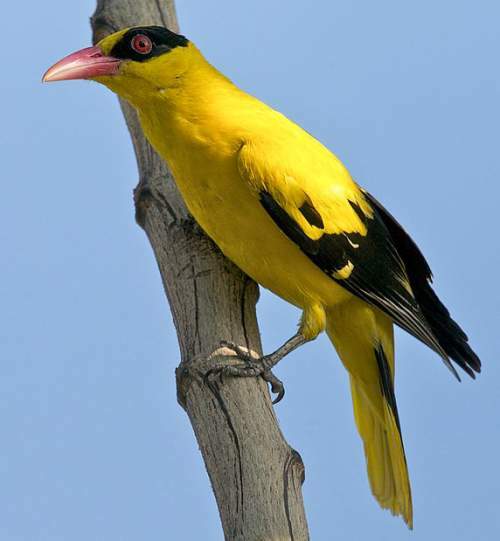 In India, wintering black-naped oriole species are distributed in the states of Gujarat, Madhya Pradesh, Maharashtra, Karnataka, Goa, Kerala, Tamil Nadu, Andhra Pradesh, Odisha, Jharkhand, West Bengal, Assam, Meghalaya, Nagaland, Manipur and Tripura. The black-naped oriole nominate subspecies O. c. chinensis is distributed in Philippines. The subspecies O. c. diffusus is migratory and occurs in China, Russia, North Korea, South Korea and northern parts of Myanmar, Laos and Vietnam. The oriole subspecies O. c. andamanensis is endemic to the Andaman Islands. The subspecies O. c. macrourus is endemic to the Nicobar Islands. The subspecies O. c. melanisticus is distributed in the Talaud Islands of Philippines. These black-naped oriole species have moderate forest dependence. They normally occur in altitudes from 0 to 2000 meters. The artificial ecosystems and habitats of these species include urban areas, plantations and rural gardens. The natural ecosystems and habitats of these black-naped oriole species include tropical and subtropical mangrove forests, evergreen forests, tropical and subtropical moist lowland forests, deciduous forests and moist montane forests. 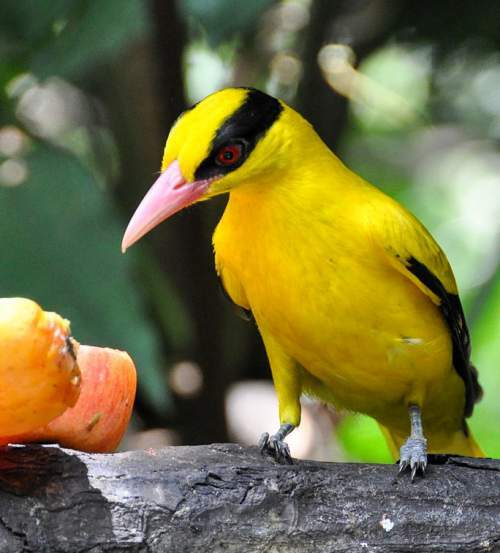 The diet of these black-naped oriole species consists mainly of fruits. Wild fruits, orchard fruits, berries and figs are their primary food. They are known to take nectar from large flowers of Salmalia and Erythrina species. They feed from the canopy and rarely come to the ground. They also glean insects from the branches and foliage. The breeding season of these black-naped oriole species is during May and June in Russia. The laying season is during June and July in China. The breeding season is from April to June in Andaman Islands. These oriole species are monogamous and highly territorial. The nest is usually built in a fork of a tree. The deep cup-shaped nest is mostly built by the female. The oriole clutch contains two or three pale pink eggs with red and dark blotches. The female oriole incubates the eggs. The chicks hatch out after 14 to 16 days and fledge after fifteen days. These black-naped oriole species are partially migratory birds. The breeding populations of the subspecies O. c. diffusus occur in China, Russia, North Korea, South Korea and northern parts of Myanmar, Laos and Vietnam. These oriole species migrate southwards in September-October to India, Bangladesh, Cambodia, Thailand and southern parts of Myanmar, Laos and Vietnam. The return migration to the breeding grounds occurs in early summer. There are resident populations of these black-naped orioles in Andaman and Nicobar Islands of India (O. c. andamanensis and O. c. macrourus), Malaysia, Singapore, Indonesia, Philippines, Taiwan, west central Myanmar and Hainan (China). The global population size of the black-naped oriole (Oriolus chinensis) has not been quantified. The overall population trend of the species is not known. In most of its range, this species is reported to be common (Kennedy et al. 2,000). The generation length is 3.7 years. Its distribution size is about 21,100,000 sq.km. Habitat alteration and destruction, deforestation and human intrusions and disturbance are the main threats that are endangering the survival of these oriole species. The black-naped oriole (Oriolus chinensis) does not approach the thresholds for being Vulnerable, either under the range size criterion, or under the population trend criterion or under the population size criterion. The IUCN (International Union for Conservation of Nature) has categorized and evaluated the oriole species and has listed it as of "Least Concern". The CITES (Convention on International Trade in Endangered Species of Wild Fauna and Flora) status is ‘Not Evaluated’ for the black-naped oriole (Oriolus chinensis). The black-naped oriole (Oriolus chinensis) is closely related to slender-billed oriole (Oriolus tenuirostris). O. c. yamamurae Nagamichi Kuroda, 1927. Current topic in Birds of India: Black-naped oriole - Oriolus chinensis.